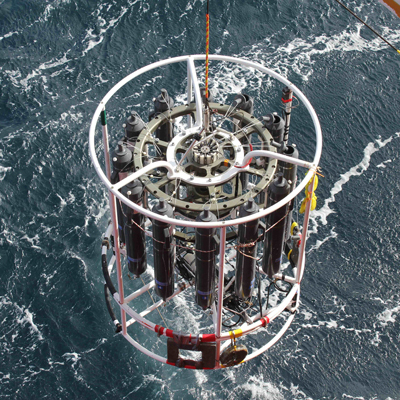 In a series of studies, GPS-tracked surface drifters were used to explore the surface circulation of the northern Weddell Sea and the Scotia Sea. 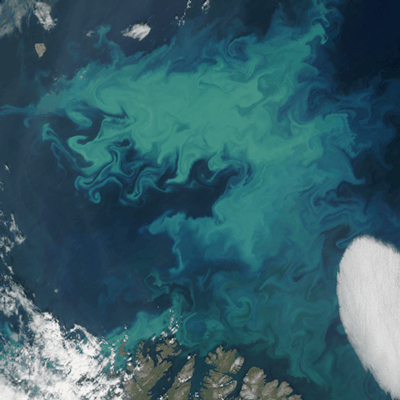 The Scotia Sea is one of the few regions in the Southern Ocean to show elevated surface chlorophyll values, which is consistent with advective pathways of iron, typically the limiting micronutrient, from the continental shelf. The iron is carried in narrow, turbulent boundary currents. 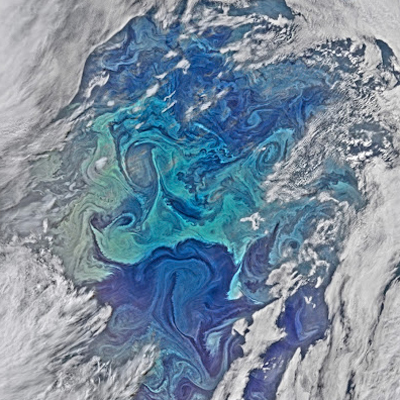 A snaphot of surface chlorophyll, based on satellite ocean color observations, shows a summer-time bloom in the Scotia Sea. 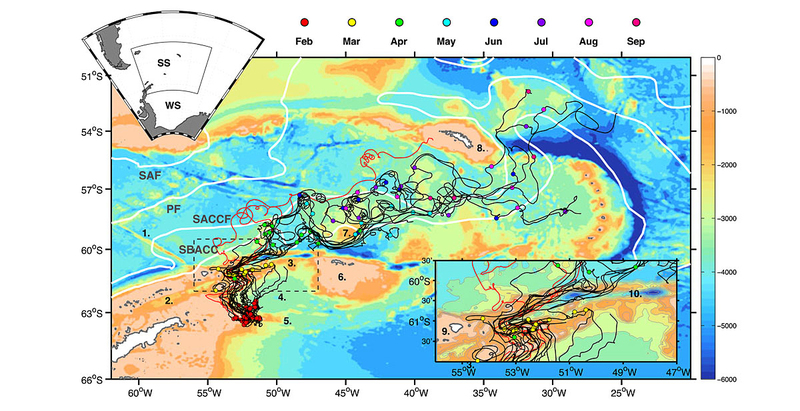 The bloom is believed to be initiated by the injection of iron-rich waters from the Weddell Sea and is tightly constrained by the strong frontal features of the ACC (white curves). Surface drifter trajectories from the ADELIE field program in the Weddell Sea show three different fates for exported surface water masses. 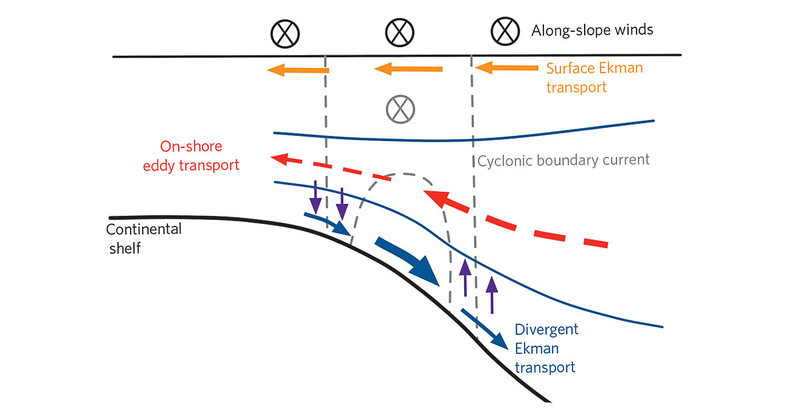 The different pathways are influenced by the bifurcation of the strong Antarctic Slope Front Current found along the shelf break in most regions of the Antarctic margins. Drifters eventually enter the Scotia Sea to the north, but may carry different properties (nutrients) based on their pathway. Warm Circumpolar Deep Water provides a reservoir of heat that is responsible for the rapid thinning of ice shelves fringing the Antarctic margins. Here, high-resolution glider observations of ocean temperature show the process of eddy-shedding of warm water onto the continental shelf. This turbulent process regulates the on-shore heat transport in this interior density class removed from frictional boundary layers. The meridional overturning circulation of the Antarctic margins is modulated by a series of strong jets and fronts that are found over the continental shelf and slope around the continent. 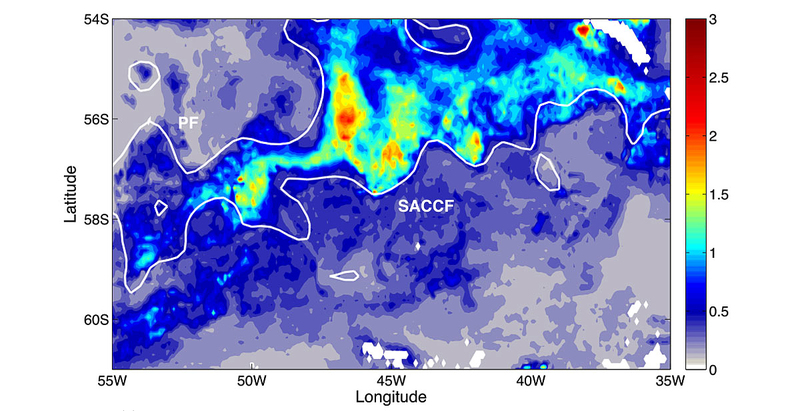 The generation of mesoscale and submesoscale eddies are required to enable the transport of water Circumpolar Deep Water onshore in regions where AABW cascades off the shelf. The subpolar circulation of the Southern Ocean, comprising that region south of the Antarctic Circumpolar Current, is a key component of the climate system. It is a region of strong water mass modification, critical for the closure of the global overturning circulation. Both large-scale gyres and strong boundary currents found along the continental shelf and continental slope act to modulate the delivery of warm water towards floating ice shelves that buffer the Antarctic ice sheets. 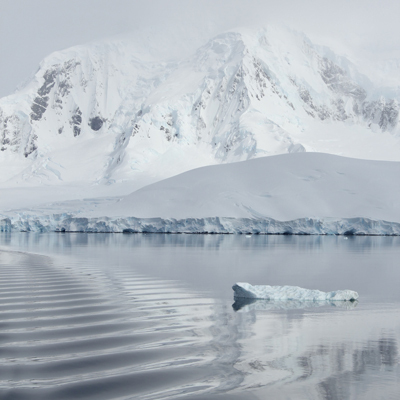 Through a combination of numerical and observational studies, our work has shown that mesoscale variability plays a key role in influencing the transport of warm deep waters towards the Antarctic continent. Stewart, A.L. & A.F. Thompson, 2016. Eddy generation and jet formation on the Antarctic continental slope. J. Phys. Oceanogr., in press. Zhang, X., A.F. Thompson, M.M. Flexas, F. Roquet & H. Borneman, 2016. Circulation and meltwater distribution in the Bellingshausen Sea: from shelf break to coast. Geophys. Res. Lett., 43, 6402-6409. Youngs, M.K., A.F. Thompson, M.M. Flexas & K.J. Heywood, 2015. 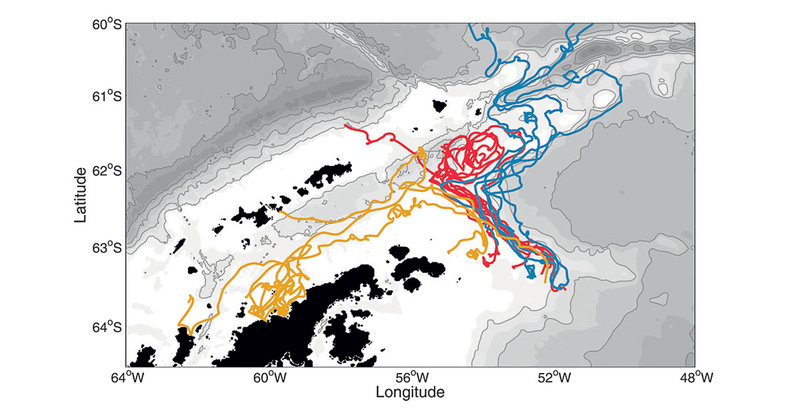 Weddell Sea export pathways from surface drifters. J. Phys. Oceanogr., 45, 1068-1085. Stewart, A.L. & A.F. Thompson, 2015. 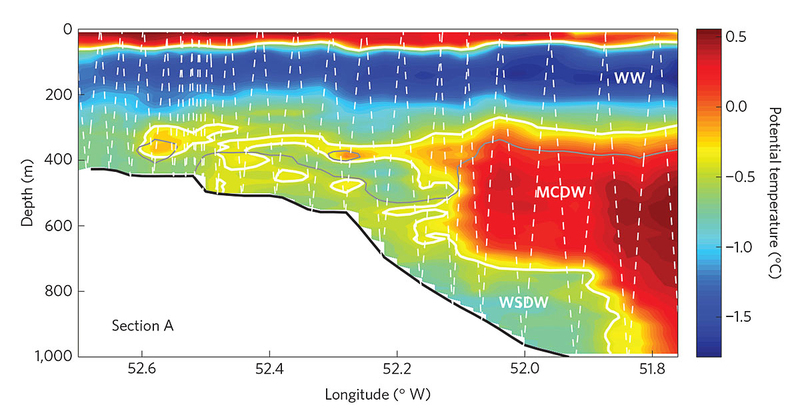 Eddy-mediated transport of warm Circumpolar Deep Water across the Antarctic shelf break. Geophys. Res. Lett., 42, 432-440. Schmidtko, S., K.J. Heywood, A.F. Thompson & S. Aoki, 2014. 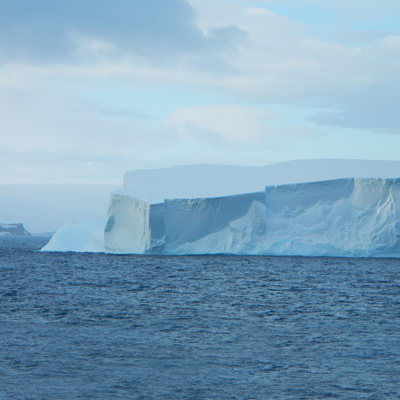 Multi-decadal warming of Antarctic waters. Science, 346, 1227-1231. Thompson, A.F., K.J. Heywood, S. Schmidtko & A.L. Stewart, 2014. Eddy transport as a key component of the Antarctic overturning circulation. Nat. Geosci., 7, 879-884. Heywood, K.J., S. Schmidtko, C. Heuze, J. Kaiser, T.D. Jickells, B.Y. Queste, D.P. Stevens, M. Wadley, A.F. Thompson, S. Fielding, D. Guihen, E. Creed, J.K. Ridley, W. Smith, 2014. Ocean processes at the Antarctic continental slope. Phil. Trans. Roy. Soc. A, 372, 20130047. Su, Z., A.L. Stewart & A.F. Thompson, 2014. An idealized model of Weddell Gyre export variability. J. Phys. Oceanogr., 44, 1671-1688. Thompson, A.F. & M.K. Youngs, 2013. Surface exchange between the Weddell and Scotia Seas. Geophys. Res. Lett., 40, L058114. Stewart, A.L. & A.F. Thompson, 2013. Connecting Antarctic cross-slope exchange with Southern Ocean overturning. J. Phys. Oceanogr., 43, 1453-1471.